Be ready for a romantic getaway that you will always remember. An enchanting evening aboard of our French sailboats. We’ll sail across the Pacific Coastline and admire Cabo’s iconic places: Land’s End, The Arch, Lovers Beach and the Sea Lion Colony. This adventure would not be complete without some cocktails as you dwell on unobstructed panoramic views of Cabo’s Marina and its beautiful skyline before seeing the sky’s colors start to blend before your eyes, giving you a natural show to remember forever. A sight of the Arch that you should not miss while in Cabo. After the sunset, we will relax and enjoy some delicious gourmet appetizers: pate rolls, Mexican seafood burritos, baguettes with goat cheese, succulent melon, locally sourced crab, cured prosciutto, Italian smoked salami, Dutch Edam. No matter who you are sharing this amazing evening with, that special someone, your family or friends, we assure you that it will be one of your favorite nights in Cabo. Cruise Passengers: This activity is not available to cruise ship passengers. However, other Sailing tours are! 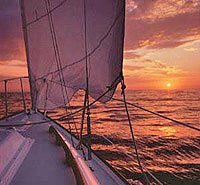 See our other great Sailing Tours here. Daily at 4:30 PM. Start time is subject to change depending on the season, but will be specified on your ticket. The Marina in Cabo San Lucas. Exact meeting instructions will accompany your confirmation. Complimentary Round-Trip Transportation from Selected Hotels.